By 2019, Cisco predicts that internet traffic from videos will make up 80% of all internet traffic worldwide. Thanks to the mass adoption of high-speed internet and in particular, mobile internet, a video is now the most powerful content marketing tool we have at our disposal. With compelling visuals and rich sounds, brands can use video to communicate their story and build relationships in a way that isn’t possible with text content. As a testament to the power of video marketing, the mere mention of the word “video” in an email subject line boosts open rates by 19% and clickthrough rates by 65%. Live video represents an emerging trend within video marketing. On Facebook, users spend 3X more time watching live videos compared to traditional videos. By broadcasting live, brands can create an intimate two-way channel of communication with their audiences. Live video can be used to host Q&A sessions, answer customer queries, host interviews with experts, give product demonstrations and more. Part of the appeal of live videos is that they’re imperfect. Audiences are forgiving of mediocre video quality and don’t mind if a member of staff accidentally walks in front of the camera – this is to be expected when you’re getting exciting behind-the-scenes footage from your favorite brand. Live video helps brands inject an authentic human element into their marketing, which is often missing in highly produced pre-recorded videos. After all, people want to buy from other people, not faceless corporations. If you’re thinking about integrating live video in your marketing campaigns, it’s worth taking inspiration from these 5 brands who are already making waves in the world of live video. Live video and professional sports are always going to be a great pairing. Of the many sports brands out there, UFC is setting an example for how to provide extreme amounts of value to its audience via live video streaming. In addition to streaming UFC events, the brand also streams press conferences, live Q&As with ring girls and fighters, weigh ins, and combat sports from other organizations. UFC’s Fightpass, which is like a Netflix for fight fans, streams live mixed martial arts events from smaller organizations like Cage Warriors and Invicta FC. Fightpass also streams related sports such as kickboxing and Jiu Jitsu. The UFC understands its audience well. If someone wants to watch a mainstream UFC event, there is a good chance they’ll also have an interest in a more niche Jiu Jitsu tournament. The fighter weigh ins take place one day before UFC events and receive a huge viewership online. People love the intensity of the face offs and want to see which fighters look like they’re in shape (or not) before they fight. When fighters miss weight, it’s usually a topic for conversation. Knowing that UFC fans simply can’t get enough fight action, the UFC recently started a Tuesday Night Contender Series which features rising talent and is filmed in a smaller, intimate surrounding that makes Fightpass viewers feel as if they’re in the audience themselves. With Snoop Dogg as the commentator, it makes for some highly entertaining viewing every Tuesday. 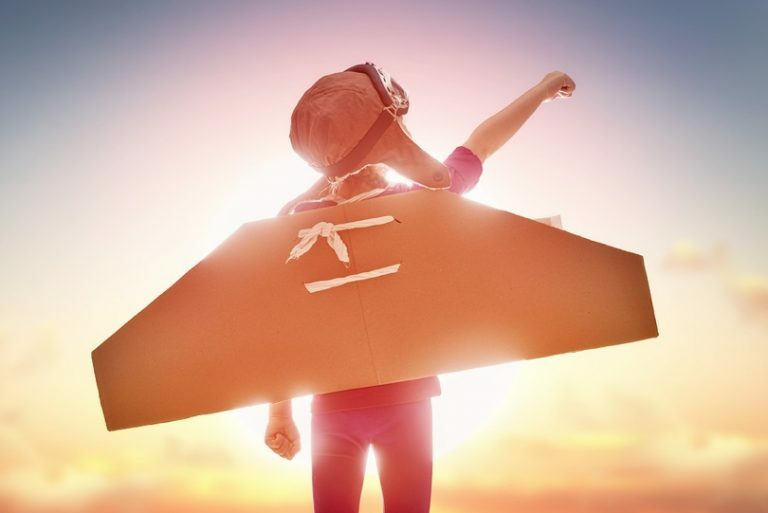 Finding out what people want and then giving it to them is the core premise behind successful businesses. The UFC is able to do this very effectively using live video. It’s hard to write an article about live video marketing without mentioning BuzzFeed. Due to a disastrous failed attempt to host a Facebook Live video with President Obama, BuzzFeed and live video will always share an association. Despite this one mistake, BuzzFeed usually delivers the goods with its live video marketing. BuzzFeed’s live videos aren’t always the most intellectually sophisticated, but the brand knows what types of videos are compelling to watch. 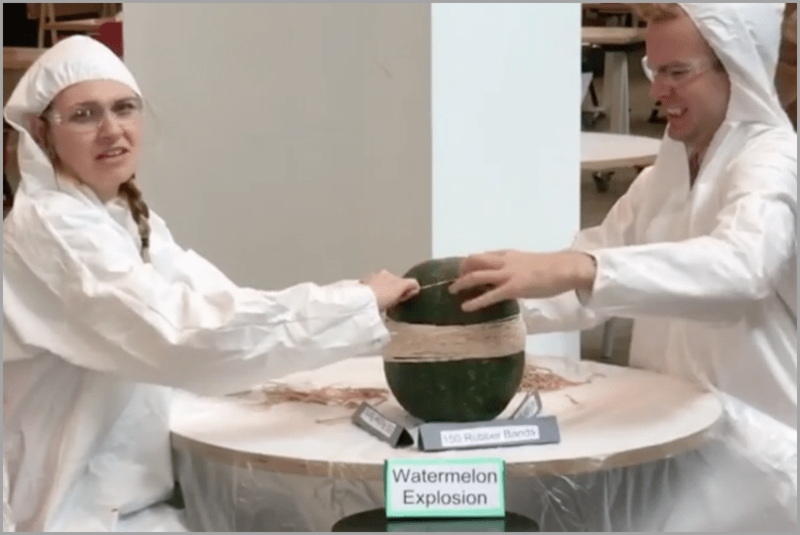 For instance, in April last year, 807,000 people watched live as BuzzFeed employees exploded a watermelon using rubber brands. Since then, the video has gone on to accumulate an additional 11 million views worldwide. This is one of the reasons that live video is so powerful. You can create an intimate connection with people watching in real-time, but the content will live on to give your brand exposure for months or even years after the event. Another of BuzzFeed’s crazy live videos was a dance battle where viewers could vote on performances and provide suggestions for dance moves. It also proved to be popular, although I have no idea how you dance like a cabbage patch or pregnant dog. Providing behind-the-scenes footage is a great way to showcase the human side of your brand and build rapport with your audience. If you’re a fan of the delicious snacks that Dunkin’ Donuts manufactures, it makes sense you’d be interested in the production process used to create them. In February 2016, Dunkin’ Donuts hosted a live tour of its facilities, including a test kitchen which is used for staff training purposes. The video also includes interviews with staff experts who provide unique insights into the brand’s most popular products – such as the visually appealing Iced Macchiato. The highlight of the video was undoubtedly the donut factory. A staff member explains the process for laying out the dough, cutting the right shapes out, frying it, decorating it and creating donut cakes. While interviewing the donut expert, it’s revealed that he has been working at the company for 41 years. This subtly conveys that Dunkin’ Donuts is a company that values its employees, which makes it appear more trustworthy to consumers. Even if your facilities don’t include an awesome donut factory, you can still use live video to authentically showcase your staff and workplace in order to build rapport with your audience. Live video is a great tool for breaking industry news and showcasing new technologies. 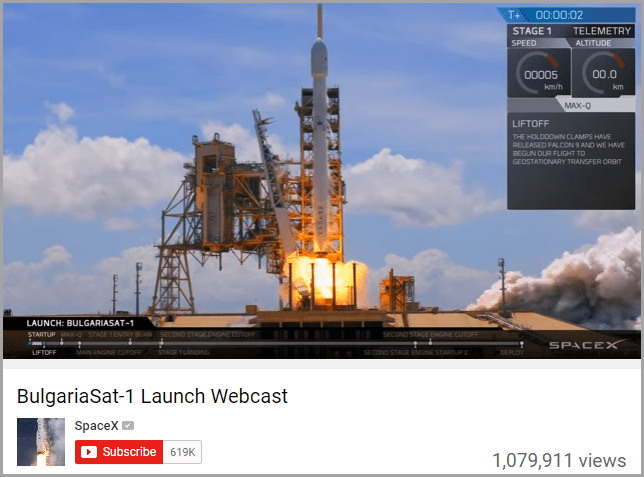 Space X manages to accomplish both using live webcasts of rockets being launched into space. Because of the compelling visuals, these videos are inherently viral. However, Space X also creates a sense of camaraderie around the brand, as people across the world are able to join together and communicate as historic milestones are being reached. Even when a live feed suddenly cuts out it doesn’t negatively impact the Space X brand since it’s understandably challenging to maintain a perfect video feed of a rocket being launched. Some have speculated that a recent feed was deliberately cut off to avoid showing UFOs, but that’s neither here nor there! While your product might not be as exciting as one of Space X’s Falcon 9 rockets, live video can be used to provide in-depth product demonstrations where you can answer questions in real-time to alleviate purchasing fears and build trust. When you consider that 4X as many consumers would prefer to watch a video about a product than read sales copy about it, it’s easy to see why live videos are ideal for showing off products. 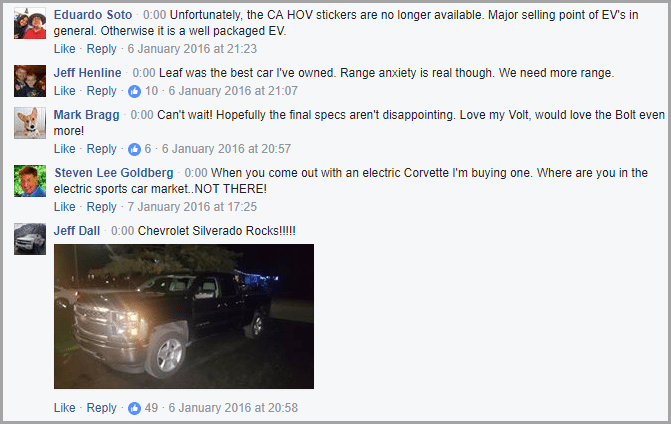 In order to create a buying frenzy for the launch of the all-electric 2017 Bolt EV, Chevrolet used Facebook Live to stream a video from the consumer electronics tradeshow, CES 2016. The Chevrolet spokesperson emphasizes how societal trends like sustainability and urbanization have led to an increased consumer demand for electric cars. By providing context around this emerging technology, it demonstrates that electric cars are valid and necessary for the future. Not so long ago electric cars were viewed contemptuously, so there are still some fears to alleviate in terms of how well the vehicles can actually function. Videos like these provide a platform for the worldwide tribe of Chevrolet owners to discuss their favorite vehicles. In this regard, live video isn’t just an opportunity to promote your brand – it also enables you to bring your audience together and make them feel a part of something greater than themselves. This is a winning strategy for longevity in your business. Can you think of any other brands that are crushing live video right now? Please let me know in the comments below. Guest Author: Aaron Agius is an experienced search, content and social marketer. He has worked with some of the world’s largest and most recognized brands, including Salesforce, Coca-Cola, Target and others, to build their online presence. See more from Aaron at Louder Online, his blog, Facebook, Twitter, Google+ and LinkedIn.